Choosing the perfect color scheme will be a major stumbling block in your bathroom remodeling project, but you should always opt for what makes you happy and can create a cheery vibe in your space. According to HGTV.com, a green color scheme is always a hit and it can be paired with mosaic tile and other modern bathroom accessories to create a dynamic aesthetic. A pale green is the ideal choice for a bathroom and it can create a warm atmosphere during the day. However, you'll want to balance this strong color with white furnishings - anything from a bathroom vanity to white tile floors can help to provide a neutral backdrop for your green decorative additions. Another tip is to incorporate mosaic tile into your shower stall. Use white tile to form the background of the shower and then use green mosaic tile as a border around the inside of the shower. Be sure to use a lighter or darker shade of green when picking tile to give your space a bit of color contrast. 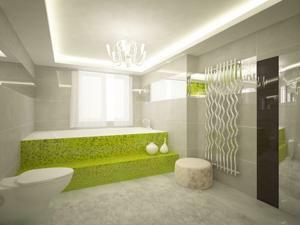 There are countless color schemes to choose from when designing your bathroom, but a green one could give you plenty of flexibility to show off your sense of style. What items would help to spruce up the look of a green bathroom?